A single tweet from a serving Eastbourne officer has sparked a huge debate about staffing levels at Sussex Police. PC Dave Elliott said working with minimum staffing levels was not safe and ‘something needs to be done’ after an extremely hectic Saturday night shift involving ‘weapons’ ‘assaults’ and mental health incidents. In response, a number of retired police officers have come out in support of PC Elliott – including former Detective Chief Superintendent Kevin Moore. Mr Moore, who also served as DI for Eastbourne CID, has now launched a petition calling for more police officers to be hired. He says he is concerned about ‘dangerously low numbers’ of frontline officers. He is calling on police bosses to recruit more officers to deal with crime and better protect the public. This comes after he said an officer told him one single crewed officer covered the area of Lewes and Seahaven for an entire night shift recently. By the end of it, the officer said he was ‘broken’. 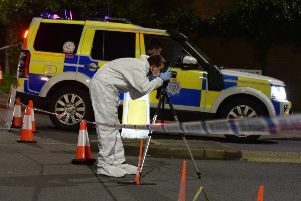 Speaking in a letter as part of a group of retired Sussex Police officers, Mr Moore said, “We, probably along with large numbers of the public, have become increasingly concerned regarding the ability of Sussex Police to be able to respond to incidents reported by the public. “They have a genuine concern that the low numbers of front line police officers available may lead to the safety of the public and the officers themselves being compromised. Mr Moore, who lives in Seaford, says police officer numbers in the county have fallen from 3,200 to around 2,500 between 2010 and today. He said that whilst the Police and Crime Commissioner (PCC) Katy Bourne has secured a considerable increase in funding for 2018/19 through a rise in council tax, this money is mainly going towards recruiting 140 additional PCSOs – a claim which is disputed by the PCC. Mr Moore said, “Whilst this may assist in increasing a uniform visibility, PCSOs do not possess the powers of police officers and therefore cannot deal with the types of incidents that officers can respond to. This is not designed to undermine the work of PCSOs, but this issue should be about increasing the numbers of police officers. “Our neighbours in Kent are looking to take on an additional 200 police officers. Other forces within the country are also looking to increase police officer numbers similarly through reducing numbers of PCSOs including Lincolnshire and Norfolk. “We therefore pose the question as to why Sussex are choosing to recruit extra PCSOs when the Force is struggling to attend incidents reported by you, the public. “The time taken for officers to attend incidents reported by the public has increased considerably in recent times. This is despite the fact officers no longer attend certain crime types that they used to such as household burglary or other incidents determined to no longer require the attendance of a police officer. Mr Moore is calling on members of the public with similar concerns to contact the PCC (pcc@sussex-pcc.gov.uk) and Chief Constable of Sussex Police. His petition has gathered more than 800 signatures and is available here. Also responding to Mr Moore and PC Elliott’s comments, Chief Superintendent Nick May said, “I absolutely recognise that teams are tirelessly working to meet the challenges they face every day. Our new Local Policing Model was designed to meet our current demands with the resources we have available. And DCC Bernie O’Reilly said, “The increase in the precept means that over the next four years we will be recruiting hundreds of new police officers. We will actually have over 200 more police officers working across Sussex than we had previously planned for. But this has in turn raised questions over whether these additional police officers are simply replacing those Sussex Police has lost in cutbacks. Will the council tax rise go towards new officers or is it simply to keep the status quo? This is among a number of questions the Herald has put to Sussex Police to clarify the number of ‘additional’ officers the service says it is going to be recruiting. See the Herald newspaper and website this week for an update on this issue.